THESE past few weeks Joburg motorists experienced a hail storms that left many drivers trying to hide under bridges, roadside trees or covered parking. But many unlucky motorists were left with dings and dents in their cars – upsetting for those who had vehicles looking like they were straight out of a showroom. 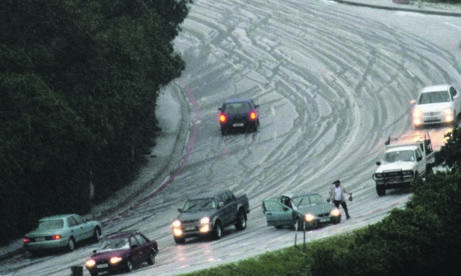 Richard Green, national director of the South African Motor Body Repairer’s Association, said: “Most hailstone dents can be fixed by paint-less dent removal. This is done by professionals pressing, gently hammering or buffing out each single dent. Here are some tips if you are ever caught in another storm. Keep calm: The golden rule is to keep calm, lower your speed and turn your lights or hazards on. Find a safe place to pull over: Try to pull over and wait out the storm under cover. If you can’t, stay in your car to avoid personal injury. Trees offer the extra danger of falling branches. Turn your car to face the hail: Your windscreen is made from strong, reinforced glass and will take impacts that break other windows. Keep a heavy blanket: One or more heavy blankets in the boot can be used to protect the bonnet and roof from hail damage. Speak to your insurer: Notify your insurance company immediately about the storm and damage. It is advisable to take photos of your vehicle for you and your insurer’s reference. If you want to pay for small repairs – replacing a broken wiper blade or smashed headlight – still let your insurer know of your intent to do so.